Crystal Karges, MS, RDN, IBCLC, is a Registered Dietitian Nutritionist, Board Certified Lactation Consultant, and mama of four (almost 5). With a San Diego based nutrition practice, Crystal helps mamas nurture a peaceful relationship with food and their bodies at any stage of the motherhood journey. As a survivor of an eating disorder and postpartum depression, Crystal is passionate about empowering mothers to nourish themselves first, so that they may better nourish their families. Crystal infuses both personal and professional experience into her nutrition counseling practice, with over 10 years of involvement in the fields of maternal health, child nutrition, and eating disorder recovery. By serving mothers and families through her online blog and locally, through her private practice, Crystal is committed to creating a community of strong, thriving mothers, who are learning to nourish their families’ minds, bodies, and spirits. In this episode, Crystal shares about her transition to motherhood. She opened up about her experiences with eating disorder recovery, postpartum depression and how she uses those experiences to help advocate for her clients. Crystal highlights that motherhood is defined by growth and is about being adaptable and open to learning. She emphasizes the importance of learning to lean on others for support who care and understand what you’re going through. 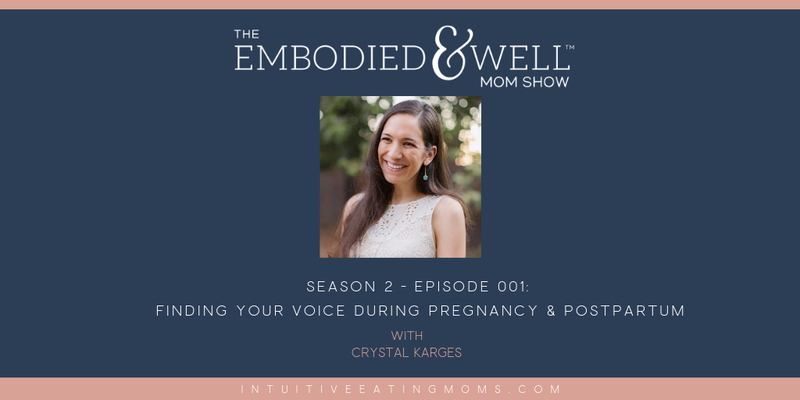 Crystal talks about the pressures and frustrations that most women go through during pregnancy particularly about developing insecurities when it comes to what to eat during pregnancy, the pressure to gain a certain amount during pregnancy and the expectation to “bounce back” after baby. Crystal also encourages moms to be advocates for themselves. She encourages moms to find their voice and to communicate what they need. She also emphasizes the importance of finding a support group that can help you maintain a sense of peace during the pregnancy and postpartum journey. ← 001 Introducing The Embodied & Well Mom Show!